You know how when something not great happens, then more not great things happen? We're kind of in that right now. We found mold in our house last week, specifically in Baby Plum's room. Baby Plum sleeps in that room, while Cheese Puff's clothes are in the dresser in there. We first found the mold on Cheese Puff's dresser. We also found it on the changing table and in our bedroom in our closet and on a vintage radio that I made into a jewelry cabinet years ago. While dealing with that, our fridge stopped working on Saturday. The freezer still worked. We had to replace our last fridge after 13 months. We bought the warranty with this one. They came out on Tuesday. Dude was not friendly, but he ordered a part, and our fridge is working. It should continue working until the part comes in. While out shopping for some flexible hose for our french drains, Little Elvis stood in an ant bed. They didn't appear to be fire ants, but he screamed and yelled and broke out in hives. The hives are completely gone now, but one leg is twice the size of the other and his ankle looks awful. And, I think our playroom TV is about dead. I'm not sure how old it is. But it's having some major issues. Still, we manage to have fun. Baby Plum loves kicking the soccer ball. His love is infectious. 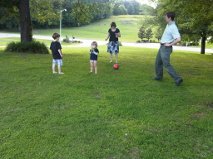 This was the best Little Elvis has ever done kicking the soccer ball! And he was barefoot. 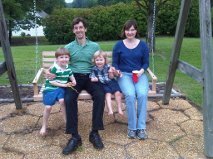 The day before, we sat out on the swing. Cheese Puff dozed with my dad while we did that. Bummer on the series of events. That kind of stuff always makes me appreciate the times when nothing is happening at all. When it rains it pours, right? I hate those bad luck streaks, especially because you know once you hit that point of two or three in a row you know the universe has it's eye on you. Hope things switch back to good soon! i do hope everything gets worked out. glad to see the update & cheese puff is going down a little easier.